The aural timbre of Manuel’s Tavern is not so much a din as it is a yawp. Particularly so on nights of political speeches and debates, where patrons sneer, huzzah, and groan over televised political performances. This soundscape is nothing new; during President Jimmy Carter’s State of the Union Address in 1980, which focused on the hostage crisis in Iran and the Soviet-Afghan War, watchers at Manuel’s implored Carter loudly to “give ‘em hell.”1 The “aurality” of Manuel’s is part of its past and its present. It only makes sense, then, to add this layer of sensory engagement to the Atlanta Studies Network’s Unpacking Manuel’s Tavern project. 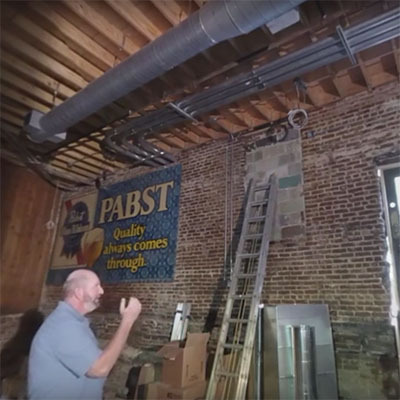 The site, a collaboration between Emory University and Georgia State University, as well as other metro-area institutions, is primarily a virtual experience of the Tavern walls – a chance to explore the “unintentional archive” that has accumulated in this iconic Atlanta gathering place.2 Users can pan the walls and zoom in on objects that have been captured via high-definition photographs. In some cases, by clicking on an object, they learn more about the object itself thanks to research by students, and, in other cases, they can hear stories told by long-time patrons of Manuel’s that give objects depth and meaning far beyond their surface appearance. This oral history component of the site is emerging and promises to give sound texture to the virtual experience of Manuel’s. Oral history is a methodology employed by humanists and social scientists to record living memory of the past – its strength is that it allows for human feelings and thoughts and opinions, captured through the nuances of voice and idiom, to complicate our understanding of history. In the case of Unpacking Manuel’s, we hope to not only document the way that patrons have used the Tavern via oral history but also to capture a sense of how they created and storied the trove of material culture that populates the place. Oral history complements the inscription of the patrons on the walls of the tavern by inscribing the patrons directly into the project. We know, for example, that Manuel’s is a site important to Atlanta’s political culture, particularly that of the left. The walls themselves suggest this record in snapshots of Jimmy Carter and Bill Clinton stopping at the bar on the campaign trail. 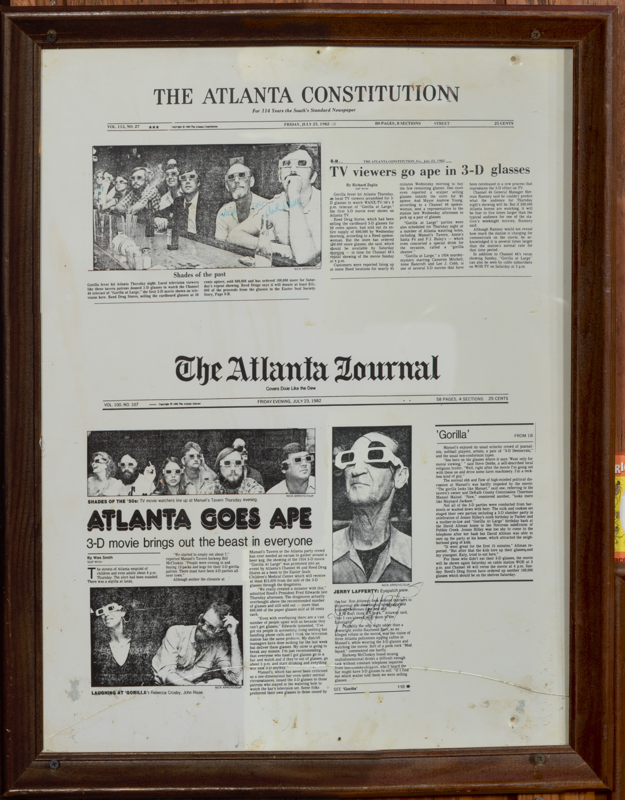 But, as recent interviewee Angelo Fuster importantly noted, “Not all of the stories here are political.” Pointing to a framed article about the first 3D movie shown on Atlanta television (see image to the right) hanging on the Northwest wall, Fuster told Brennan Collins and University of West Georgia public history graduate student Aaron Rowell about a man pictured in the photo that accompanied the article – Gerald Lafferty, also known as the “Sheriff of Shady Rest.” Lafferty was a local who lived in a “basement room” at the nearby Shady Rest Motor Hotel (now the Highland Inn) and deemed himself its protector.3 When he wasn’t tipping off police about happenings at the Shady Rest (for which he received rent reduction) he was down at Manny’s, what a policeman friend called Lafferty’s “oasis.” He was known to use the bar’s public address system to croon Irish folk tunes and served as first-base umpire for the Tavern baseball team.4 Fuster’s story of Lafferty’s death in 1983 illuminates the strong sense of familial connection felt by the bar’s regulars. The Sheriff had no known relatives in Atlanta, so Fuster and others called upon the cops who frequented the bar to track them down. They eventually found an estranged sister of his in Philadelphia, but she was unable to cover funeral costs. So, Lafferty’s friends pooled their money to pay for his final return to Philadelphia. On the day, they held a wake at the bar manager’s home – the only rule of entry being that one must wear an eyepatch, just as the Sheriff had done. Lafferty’s sister wrote a letter of thanks to the bar’s patrons (see below), which now hangs framed on another wall. “Sheriff of Shadyrest,” Unpacking Manuel’s Tavern. CC BY NC. “0101104 Memorial,” Unpacking Manuel’s Tavern. CC BY NC. 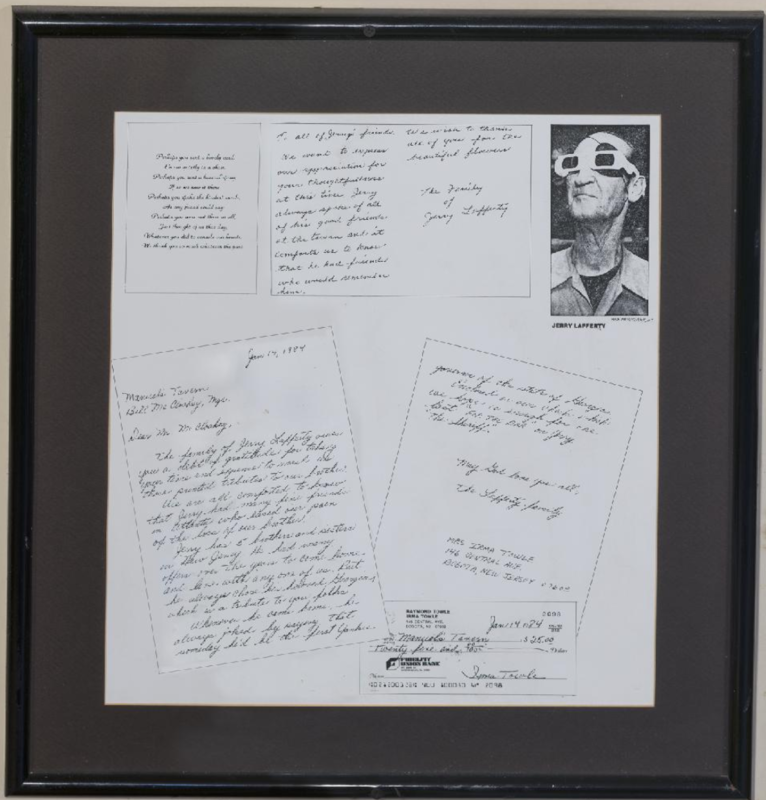 Fuster’s story of Lafferty that was prompted by the article hanging on the wall might have remained unknown or unremembered. Objects can act as mnemonic triggers, evoking memories that may not obviously connect with the object itself. The story of Lafferty’s death, for example, could not be gleaned from reading the article. 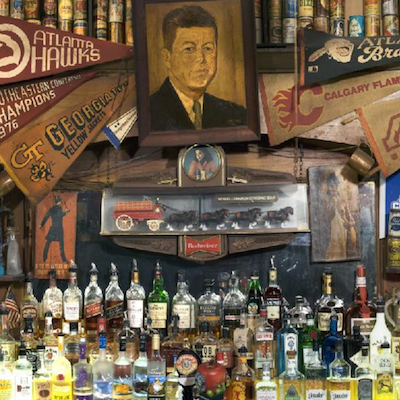 Stories like Fuster’s, that capture the affective experience of the bar and its patrons, are not ones necessarily kept in the written record of the bar or etched into the objects on the wall. Each object on the wall has an equally rich story to tell, but these stories are lost unless they are sought out and captured. Help us ensure that the unique history and experience of place at Manuel’s is preserved. 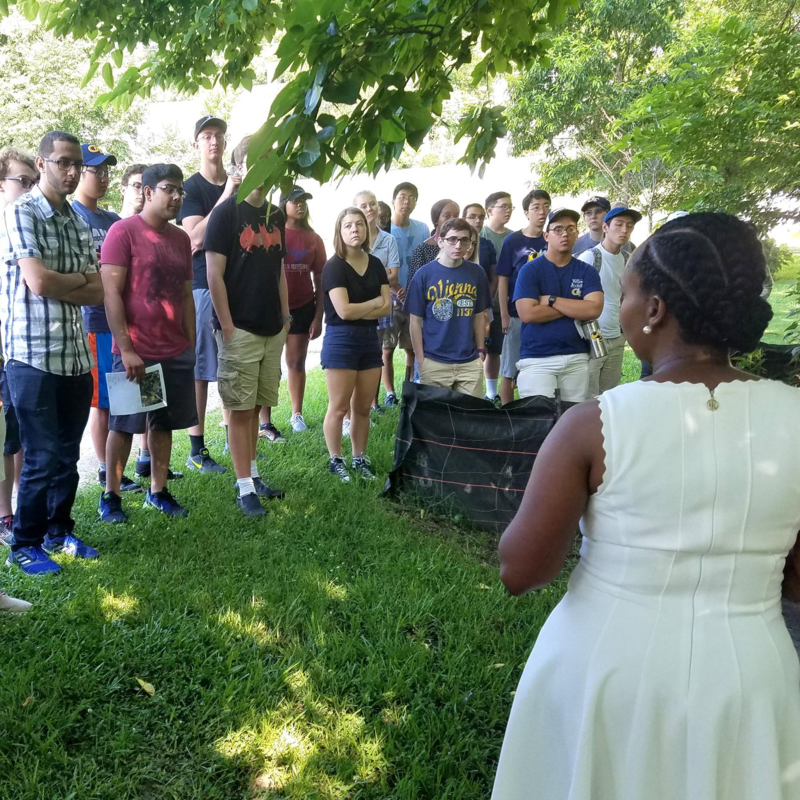 We eagerly invite you to share your memories of the Tavern and its “stuff.” Historians are standing by to listen – so if you’d like to participate, please email me at jbrock@westga.edu. 1. ↵ Tony Cooper, “Tavern Patrons Say Carter Speech ‘Needed,’” Atlanta Constitution, January 24, 1980, p. 8A. 2. ↵ “About,” Unpacking Manuel’s, http://unpackingmanuels.com/about. 3. ↵ Bo Emerson, “‘Sheriff’ Finishes His Rounds at Last,” Atlanta Constitution, November 4, 1983, 1B.